For many people, the idea of snowboarding sounds dangerous, like it was only for crazy teenage boys. The idea of skiing down a large hill or mountain sounds scary enough and the idea of doing it with a snowboard sounds too hard to be tried. If these are your thoughts, you should think again. Whether you have been skiing for years or if you have never made it down a winter mountain, snowboarding can be a great way to spend winter days. If you have been a skier and are thinking of branching out into the world of snowboarding, congratulations. The best advice I can give you is to be patient. Because snowboarding is similar to skiing and yet very different, some people who ski well will find that snowboarding comes naturally and quickly while others will find the learning process grueling and frustrating. Stick with it because eventually the tricks of snowboarding can come to almost anyone. If you have never been a skier, have no fear. 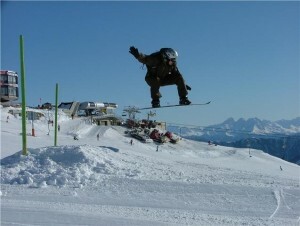 Having a skiing background is not always necessary or even beneficial in learning snowboarding skills. You, a non-ski expert, may actually pick up the techniques of snowboarding much easier than your skier friends. After some time you may find that snowboarding fits you like a glove. Allow me to offer a couple of words of advice to anyone, ski expert or not, that desires to enter the world of snowboarding. First, do not expect to jump on a board and pick up the skill all on your own. Most people will benefit greatly from taking snowboarding lessons at least to learn the basics of the sport. So do not hesitate to sign yourself up for a lesson or two before you head out to the slopes. A second and perhaps more important piece of advice is simple: rent. Resist that temptation to run out and buy the latest board and snowboarding gear just to look like a seasoned pro on the slopes. On your first few times out you should rent equipment and take the time to learn what kinds of boards best meet your needs. By renting you can avoid making a costly mistake that will leave you frustrated later.